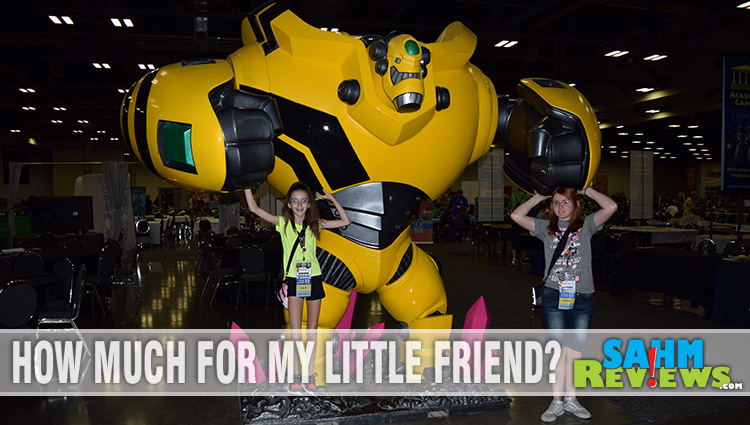 You may recall how excited we were last summer to attend Gen Con, the nation’s largest gaming conference. Scott and I weren’t sure if it would be good for the kids to attend so they stayed with my parents while we set off on this massive gaming adventure. We returned home even more excited than we expected and immediately added conventions to our 2016 family calendar. 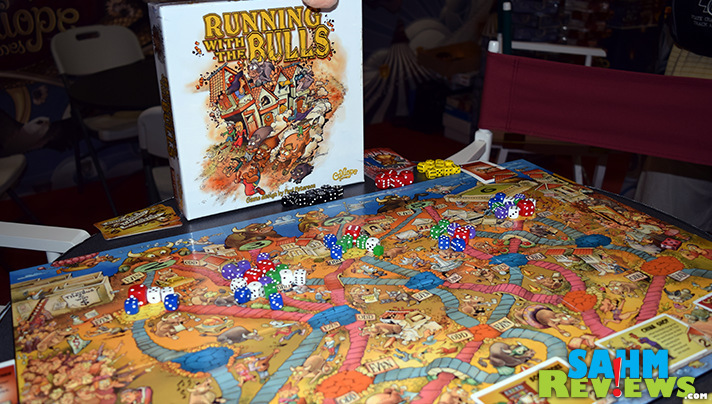 In May we took the kids out of school to attend Geekway to the West, a smaller (by Gen Con comparison) convention focused on game play. When we saw how much the girls enjoyed that, we solidified our June calendar and purchased their tickets to Origins Game Fair. 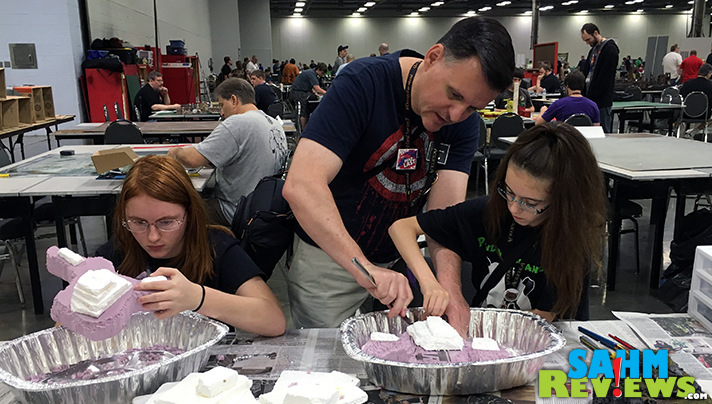 Committing to attend a convention of any kind can be a difficult decision, but we want to help you understand why Origins is a great option. Origins Game Fair is much smaller than Gen Con, but substantially more robust than a local or regional convention. 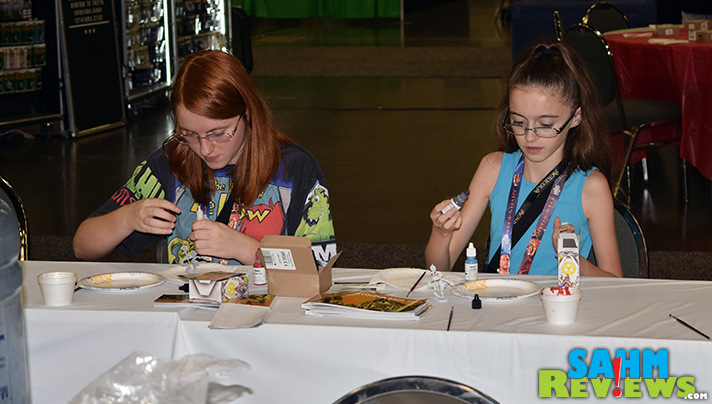 From a multitude of designers and publishers on hand to meet and play games with to the opportunity to learn new skills, Origins has a variety of activities to keep gamers young and old entertained. Here are 7 reasons you should mark your calendar to attend Origins next June. The expo hall is filled with major publishers on hand to talk about their companies, their games and generally share their love of the industry. In addition, several had an additional booth in the main gaming area to ensure their products were accessible before and after the expo hall closed for the day. Admit it. There aren’t enough games in your personal collection. No matter how many games you own, if you’re actively playing games there are always new releases that you are probably itching to get your hands on. We saw several games available at the beginning of the show that were sold out by the last day. Some releases were so scarce that publishers were sold out even sooner. 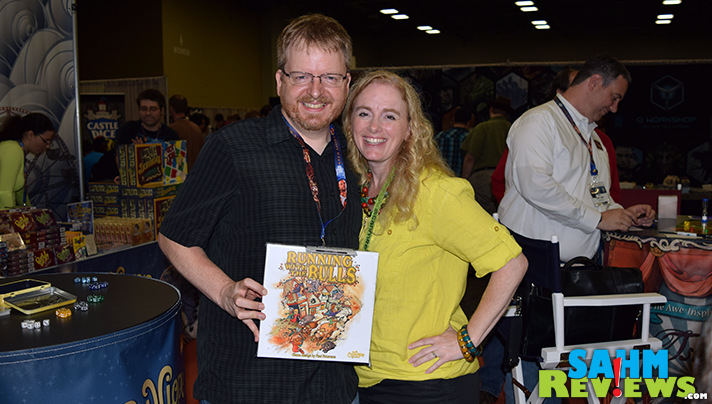 Tasty Minstrel Games informed us that Guilds of London sold out in 16 minutes. They thought they had brought enough copies to last until at least Saturday. HABA indicated they sold out of Karuba early as well. 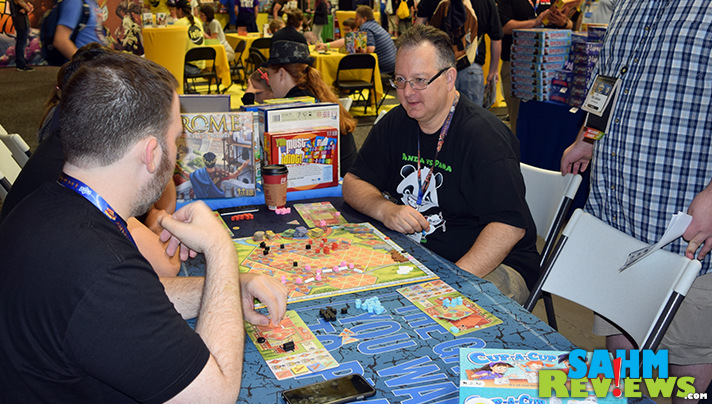 Speaking of hot games, many publishers had pre-releases on-hand for games that will be released at Gen Con as well as prototypes for games expected to be debuted at Essen in October. 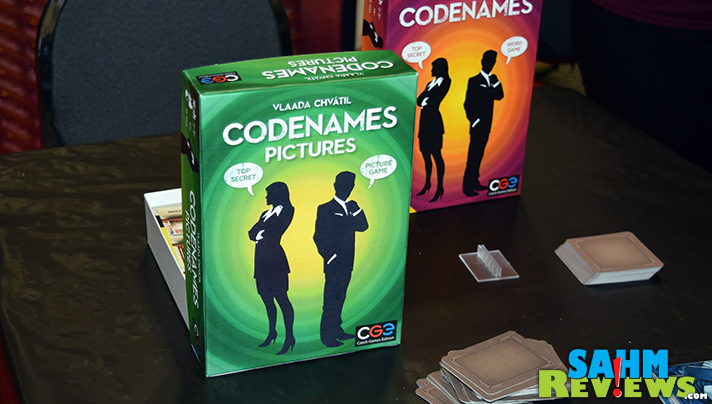 Scott spotted Codenames Pictures at the CGE booth and shared it on Facebook. Within only a couple days, the photo had been re-shared about 40 times. Guess what. We got to sit down and PLAY it, too. 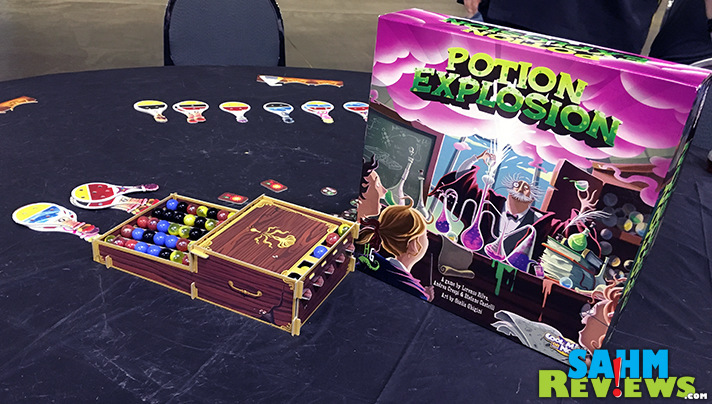 The girls were excited to be able to play Cool Mini or Not’s upcoming hit, Potion Explosion, telling us they cannot wait to get a copy of it to play at our local game meet-up. Among the pre-release and demo games available were the two previously mentioned, Costa Rica by Mayfair Games, an Alchemist expansion from CGE, three of the Titan Series from Calliope Games, Game of Energy, Star Trek Panic from Fireside Games. 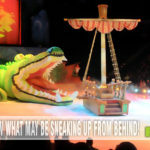 There are so many games to see, but how often can you say you played with the designer? A few times we played full games with designers while other times they were abbreviated demos. It’s usually a safe bet the designer will autograph a copy if I buy it after the demo, too. 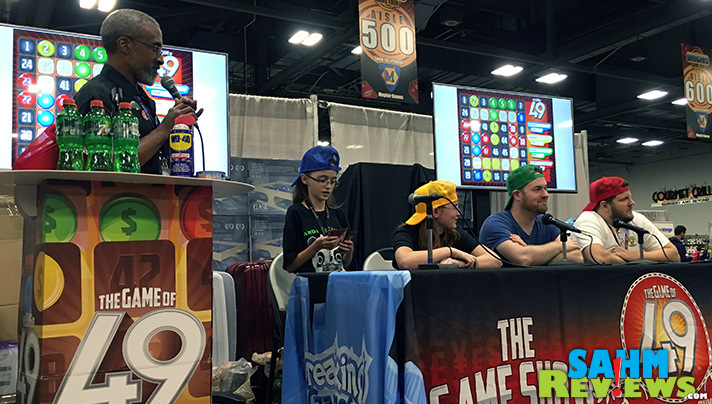 Madison and Kennedy even had a chance to play a game-show version of Game of 49 with Mark Corsey, the game’s designer. Origins offers attendees the chance to cast their vote for fan favorites in the Origins Awards. For the first few days there’s a section set aside to demo the games and cast votes. As a bonus, attendees can attend the ceremony to see if their favorites won. Origins isn’t JUST game-on. Attendees could also craft-on. We each selected a miniature to paint and later purchased generic tokens so the girls could learn to build terrain for miniatures. It was so cool that we’re sure it will become a new hobby at home. I’m guessing I will be the owner of the coolest landscape for my Dickens Village this Christmas. 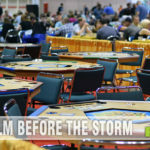 In addition to the expo hall and gaming hall, there was a family gaming area, Mayfair Games had a room for gaming, Rio Grande Games hosted another area and there were multiple people just playing in the food courts while they ate. Of course, some of us even unboxed and played some games when we got back to the hotel, too! Part of the time we let the kids play on their own, other times we played as a family. The halls were casual and the attitudes very laid back. 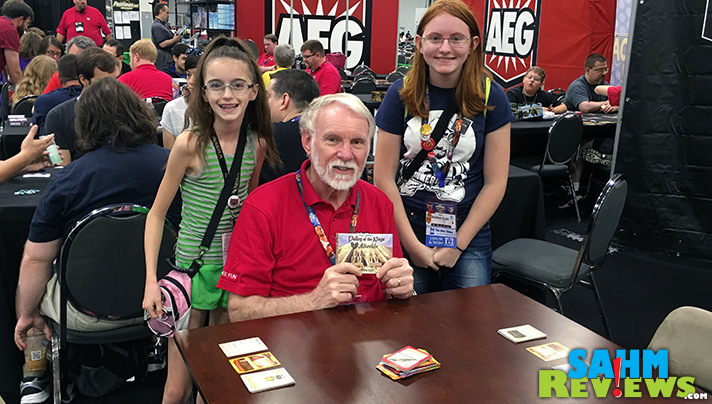 While Gen Con was a continuous, friendly mob, Origins offered a completely comfortable environment, free of stress. As a bonus, the convention center was a few minute walk from The North Market, one of the best places to grab a bite! We’ve already added Origins to next year’s calendar and plan to stay at a hotel close enough to arrive early and stay late each day. There’s so much to do, we don’t want to miss out. Will we see you there next year? What Season is It? Convention Season! It looks like your family must have a blast. I know I would with all the fun games and cool places you go. 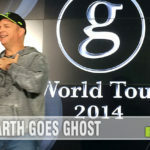 I’m planning on going next year! We weren’t sure what to expect, Ryan, but loved how casual it was. Definitely on our list to attend again. See you there next year! A friend just took her family to a game fair and they had a blast! I can’t wait until the Grandchildren get a bit older – they will love this!!!! With all the game reviews you have on here, how could you miss this fair. Looks like a gamer paradise. This would be a bit of a dream. I’ve always been a gamer and same with my husband, so as a family? We’d love to go to this game fair. Now this looks like a fun event. I do love playing games and this would be a blast to enjoy. Intersting. I am not much of a gamer but on of my friends attending a conference this year and was so excited. I would defintely try it once. That looks fun! It looks like you all had a great time. I have never heard of this before, but would love to check it out one day because it’s something different to do. I have to see about attending one of these fairs. I hadn’t heard of this before, but it sounds wonderful! Looks like quite an experience. Shame I won’t be anyware nearby to attend in the next few years. Definitely on my bucket list of things to do. Looks like a bunch of fun.